When you take into consideration that there were more than 2,500 cases of ransomware costing victims around 24 million dollars in the United States (according to the US Department of Justice) alone last year, it is no wonder why antivirus apps are some of the most popular applications on Android. While some people don’t really fear malicious software, it is more than recommendable that you should download something that protects you at all times. And even if you haven’t been infected by a virus before, isn’t it better to be safe than sorry? However, for many people, the cost represents a major barrier, and most free software has a bad reputation so they choose to leave their devices completely unprotected from the lurking dangers. However, in the last couple of years, the free safety solutions have come long way, and today, you can certainly find an antivirus that will keep you from getting infected with malware, ransomware or spyware. What’s more, you can even find an app that has additional mobile security features that are worth having, even if you are worry-free about viruses. 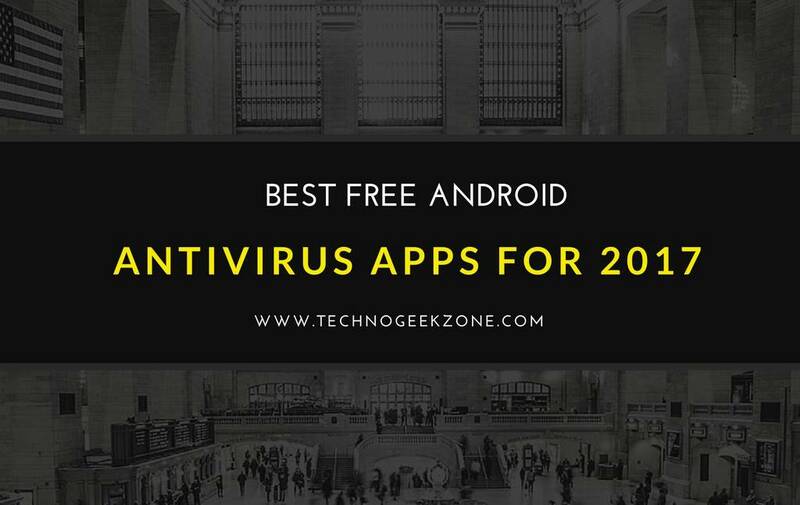 We have to point out that this is not a complete list, there many of other antivirus solutions out there on the market, and this list is constructed purely on our experience with these apps. In addition, you could always find another top 10 anti virus list that offers paid solutions, and compare the features of the ones we have on our list. Now, without further ado, let’s examine some of the best Android security apps you can get for free. 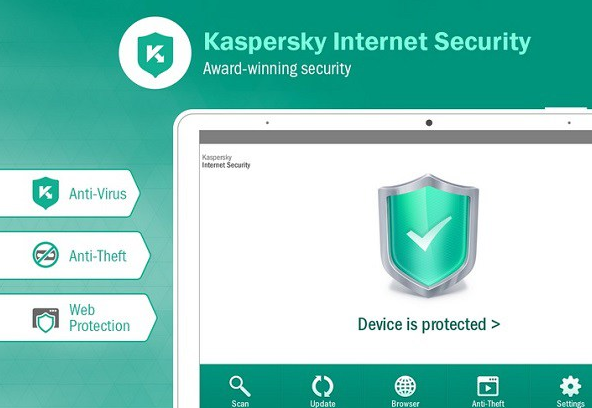 We’ll start things off with a rather light antivirus app. 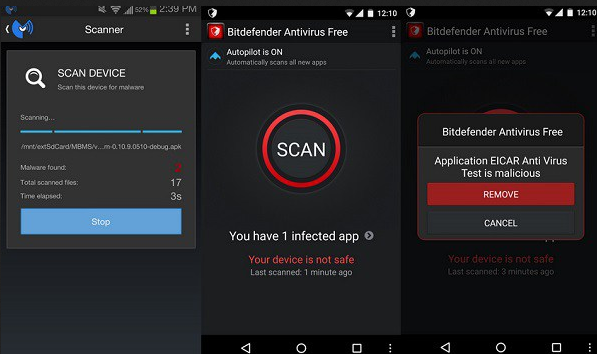 Bitdefender provides the user with real-time defense from malware and other malicious software by scanning everything you install and run on your smartphone. It is also low on resource usage, which basically means that it will not use up much space on your internal memory. According to numerous independent tests and studies, for the last five years, Bitdefender has had the best virus detection rates on the market, and the 2017 version will surely continue the tradition. Almost everyone you know is heard of AVG, and for a good reason. 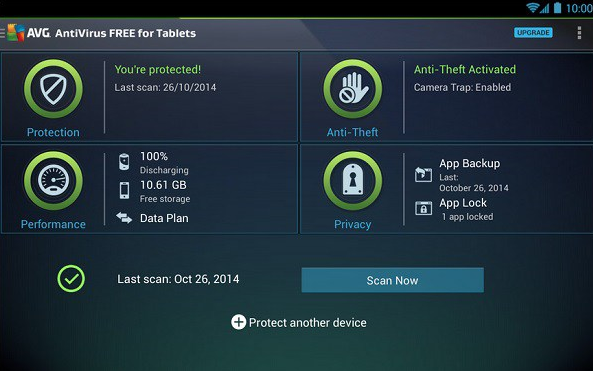 For the last couple of years, it has been one of the most consistent and popular free antivirus software for PCs. And now, it is also available for your mobile, Android device as well. You will get real-time phishing protection, alongside performance optimization, and if you lose your mobile phone, you’ll be able to locate it through Google Maps and lock it down. The pro version has many more options, but if you’re looking for something good and basic, AVG will do the job. 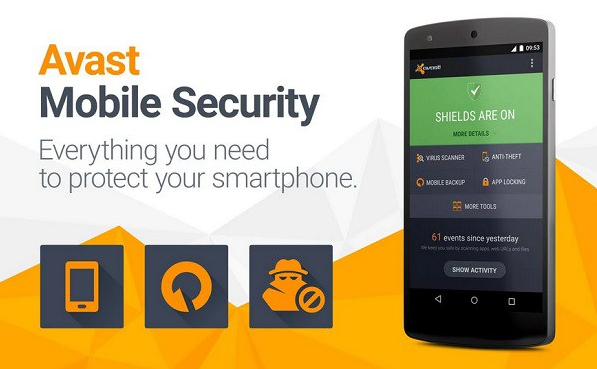 With Avast, you’ll not just get an antivirus, you’ll get a ton of additional security features that will let you protect your phone from every imaginable threat there is. For example, you have a privacy adviser that reviews all of the apps you try to install and asks for your permission to finish the installation process. You have the app usage stats that enable you to analyze patterns and detect any suspicious activity on your device and a web shield, which is there to keep all of the malware lurking on the Internet as far away from your phone as possible. We shouldn’t call TrustGo just an antivirus, because it provides several comprehensive safety functions and features that guard everything from your privacy to your software. There is the on-demand app scanner, app adviser, stats monitoring option, and a privacy-guard that will warn you if any intrusive applications tries to be installed on your phone. You’ll never have to worry about your information again, because this app allows you to create backups for the data you have stored on your phone. And if anyone enters the wrong password for your phone more than two times, TrustGo takes a picture of them and sends it to your cloud. 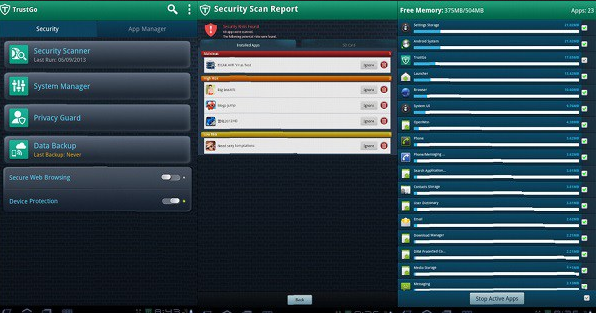 Here you have another extremely popular safety solution that is also available for Android that will keep your device completely guarded from viruses and spyware at all times. In addition, it will provide you with anti-theft protection, with features like locating, remote locking and wiping. You will also get a chance to make your lost phone ring, block any unwanted call or text, and take mugshots of the criminals remotely. So there is our list, the best thing about all of these apps is, of course, that they are free, and that you can test every one of them for a few days and if you’re not satisfied, you can easily download another one. After a couple of trial ones, you’ll definitely find that suits your device and specific needs. Finally, we cannot stress the importance of having an antivirus, especially if you live in the United States, China or Germany, three countries with the highest Cybercrime rates. 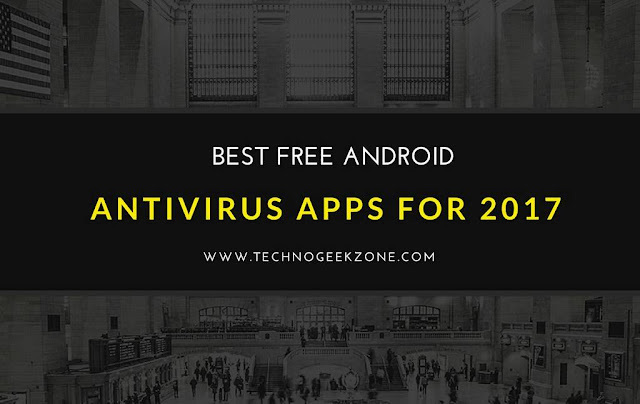 You have to agree, given the number of malware and privacy invading applications out there, you’ll have to agree that antivirus apps are necessary in today’s day and age. If you want to know anything about web development, Adam Ferraresi is your guy. He’s been writing about his job for quite a while, and if you want to catch up on his work, you can check out his latest articles (and some of the old ones if you have the time) at wefollowtech.com. What would analyze these anti-virus software and write an article about it, it was necessary to spend a lot of time and energy, but above all, you need to force yourself to do it. For each person it is very difficult, I have recently found a few tips on how to force yourself to do something http://www.huffingtonpost.com/entry/advice-on-how-to-overcome-idleness-and-procrastination_us_583a4acbe4b0c2ab94436a3a. The author, tell me, how are you force yourself to write such things, share your secret, maybe it will help someone to realize his dream.